This has nothing to do with anything, but I just read blogmaverick and thought you'd find it interesting that, by association, Mark Cuban doesn't like you. chris: Yeah, I saw that. Actually, when I accepted the Deadspin gig I told Will that I was very excited to be working for the Inside Edition of sports. Will's response was something like, "Ha ha, yeah right." It's hard to read tone through an email, but I got the feeling he took some umbrage with Cuban's opinion of his site. But what could he, or anyone else, expect? Cuban does a great job of trying to come off as logical and reasonable. But in the end, he will always, absolutely blast anybody who doesn't paint him (or his team, or his business ventures, or his hairstyle and clothing choices, etc.) in a positive light 100 percent of the time. I've always liked Mark, even his crazy antics during Mavs games (although the purist in me says he goes too far). I think he's been good for the sport of basketball, and I would be freaking thrilled if he bought my hometown Cubbies. But he seriously needs to drop the martyr complex. The dude's 50 and rich beyond any human's wildest dreams, yet he acts like an angry, spoiled child any time something doesn't go his way. I dunno. Maybe I'd act the same way if I was a billionaire. For the +/- thing, it's actually not that complex. Royal Ivey played over 43 minutes. Which is almost like a whole game minus about 5 minutes or so. So given that the 76ers weren't showing the Bucks any mercy (35 points in the 4th quarter), his -39 is not surprisingly close to the team's +/- of -43. And the reason why nobody else on the Bucks cracked -30? Nobody else played for more than 30 minutes. anonymous: Well, yeah, I mean...I've read all about +/-, so I know how it works. What I don't get, or maybe what I don't agree with, is what it's supposed to tell us about a player. Since Ivey had a -39, then he must be the worst player on the floor, right? However, as you rightly point out, he just happened to get the most PT on a team that lost by 40-some points. It was a total team loss, but that score is kind of incriminating. Needlessly so, in my opinion. I don't think the +/- score tells us anything meaningful about Ivey in this case. There are too many other factors that went into that drubbing. Glad to see you on Deadspin! 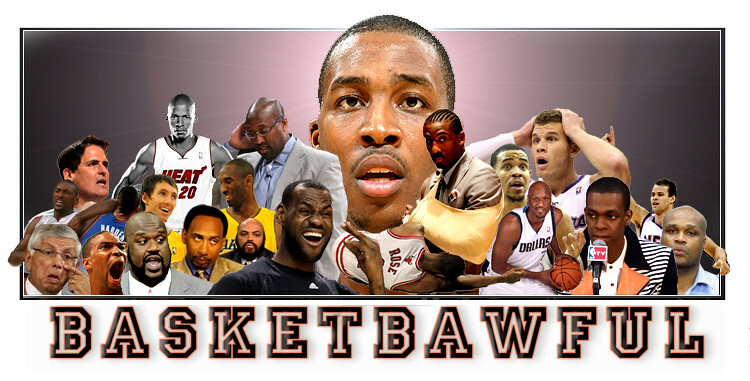 Basketbawful is a daily read for me ever since I stumbled upon it. When my Blazers lose, I am unhappy. But even as I stick pins into my new Lebron James voodoo doll (wish I'd had it last nite), I can still come here and get a laugh. BTW, Magic and Isaiah have been sharin' the man-love since the 80's. Love is blind. I used to like Mark Cuban as an owner.. he was genuninely passionate about the team and was easily one of the more involved owners in the league. He has alot of faults though, loyalty issues (good and bad), an overwhelming ego, etc. The final straw was hiring that clippers fan to root at mavericks games. Why in the hell do I want to go to the AA (American Airlines) center to watch a very likely annoying "yell leader" who is paid by the team, and that everyone knows is really someone else's fan? He's not always the brightest, but I suppose he does better than Kevin McHale. And yeah, +/- is ridiculous. It really doesn't tell you anything about anyone. Kevin Garnett as a timberwolf probably had a pretty significant negitive +/- score; point in case. shrugz: But that begs the point...why copy hockey? Like, 12 people follow that sport. Copy football, shorten the season to twelve games and let the players hit each other. With baseball bats. Hey, it's a three-sport amalgam! chris: I agree with you on Cuban. I think he did bring a lot of innovations to ownership, and that's affected the game in a mostly positive way. But yeah, trying to hire another team's "mega fan"? What's next? Outsourcing other team's mascots?